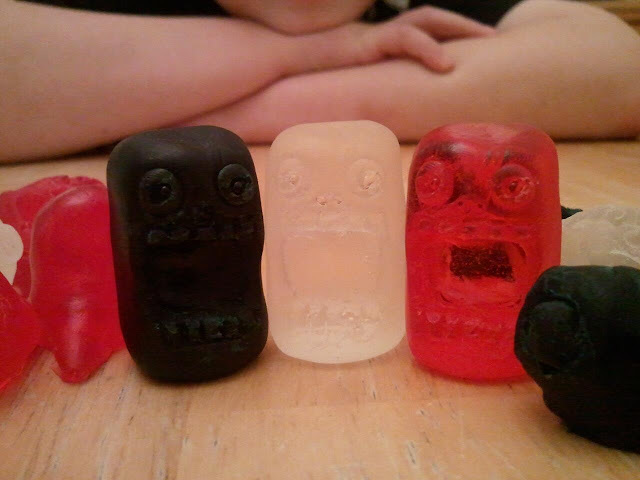 bot 2, originally uploaded by Jim1297. Click on the link to go see all of Jim's customs! He's working on more ThreeA right now... I don't know much about Jim but you can add him as a contact on Flickr when you get to his page! Friend and toymaker Jon Malmstedt (Rampage Toys) sends us this REALLY exciting work-in-progress image of a new sofubi he will be helping produce locally in Tokyo: The Manotaur. Designed and sculpted by Justin Hillgrove (Imps and Monsters), this awesome 8-inch Japanese soft vinyl toy will be made in limited colorway runs. The aim is to debut the toy at Justin's booth at the Emerald City ComicCon in Seattle in the spring. "The Manotaur roams the world in search of something he can’t quite remember. 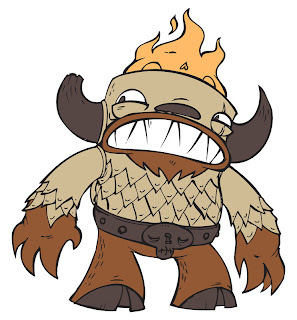 In fact, ever since he invited that fire spirit into his head he’s had trouble concentrating on little other than catering to his countless neuroses and consuming anything with the word “gummy” in the description. In any case, he’s pretty sure he’s forgetting something really important..."
Eric from Pause Designs emailed us these images of his sweet Chainsaw Panda custom, based on an 8" Dunny platform. I'm not going to lie, he emailed this to me about 3 weeks ago so he probably thinks I'm a big jerk. Well, Eric's work is tight and despite how long it took me to post this, it's DEFINITELY worthy of a post, even a late one. Also, you should really check out Pause Design's website. Pause seems to be a collective of 5 people, and they have some awesome products like t-shirts & skate decks available, in addition to videos and just a whole mess of content. Cool website. I'm impressed. Click here. 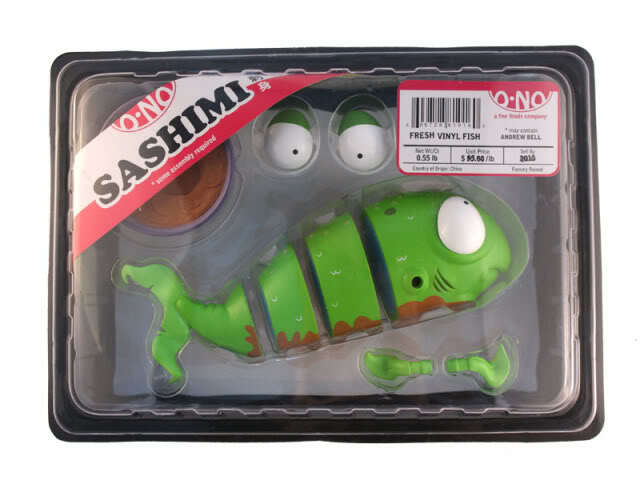 We have a lot of these O No Sashimi figure sets in stock so I knocked $10 off the regular price: now just $25 for a limited time. Buy yours here! Matt Walker of Monster Kolor has worked closely with each of these influential artists to develop colors that represent their personal styles. Each color is something they use when producing their awesome toys. 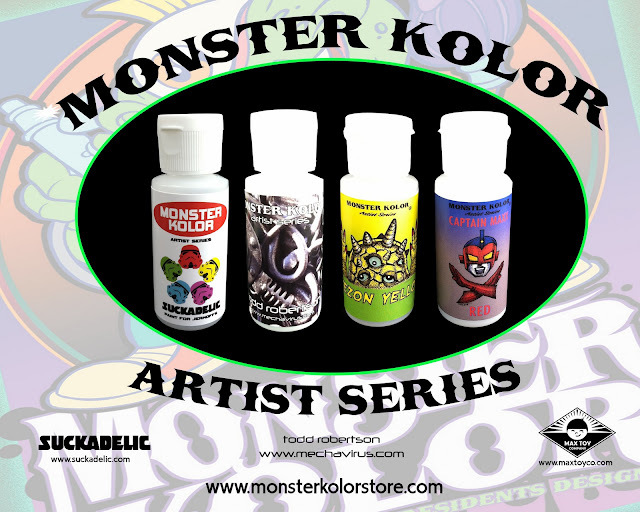 In addition to the colors themselves, each artist has designed their own custom Monster Kolor label for their colors. If your local shop doesn't stock Monster Kolor, have them contact Apex to place an order. This is Jacob Siegelbaum, son of local photog Matthew Siegelbaum (Strongtree Images). I met the Siegelbaums at the Almighty Dunny Show in Brooklyn a while back... Matthew is a collector but I think what drives him even more is the fact that his two sons also enjoy collecting art toys. Here is a perfect example of what this industry needs to progress: families getting involved in the creative process. 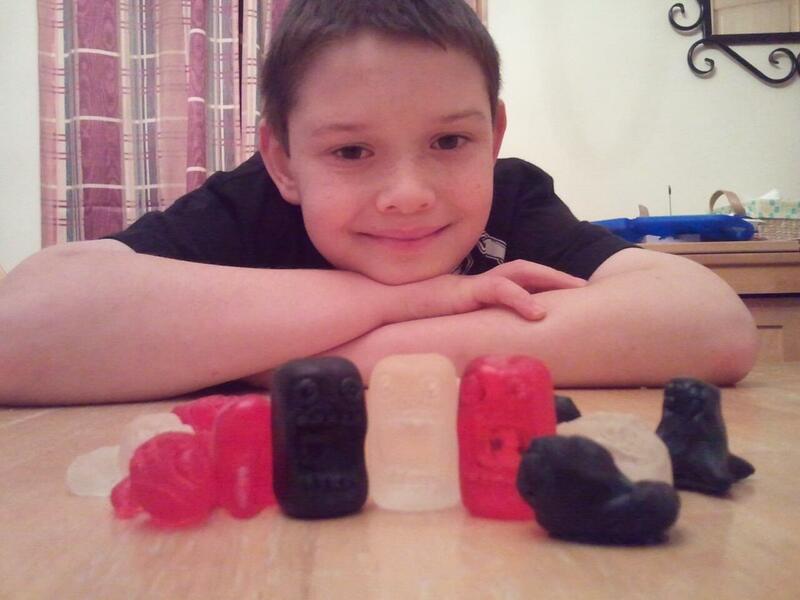 Jacob (with Matthew's help) has created several different sculpts and poured them into resin figures. 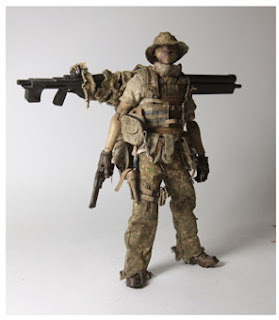 I'm super stoked to blog about this project- I bet you if Jacob sticks with this, he'll be casting resin alongside Eric Nocella Diaz and Matt Anderson before too long. Maybe I should get this kid involved in our next project? 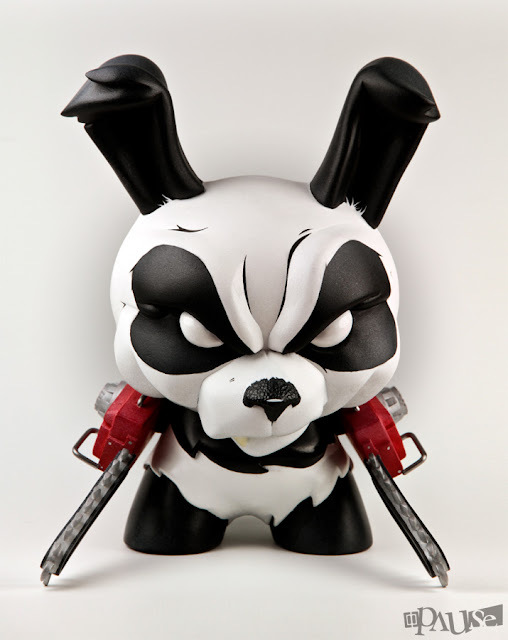 This sweet 8" custom Dunny by JFury is just one of many, many customs he's been working on lately. 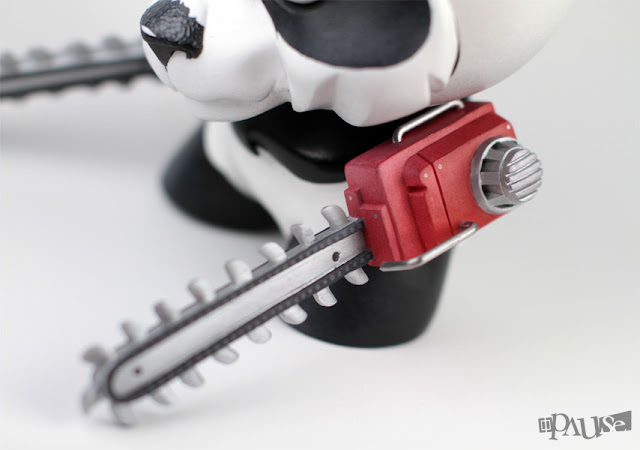 This newcomer just started customizing toys in 2011! He's banging out customs left and right, with his preferred "evil clown" characters popping up in many different iterations. I think clowns are hella creepy, so I really enjoy these customs. 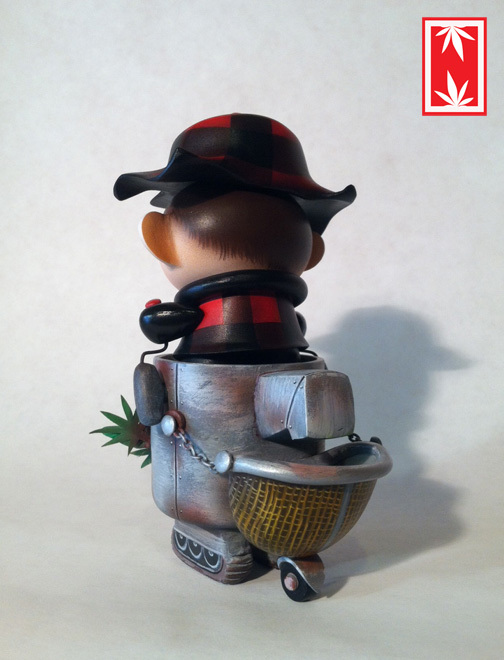 Justin placed 3rd in the Hardest Working Category in Kidrobot's Munnyworld contest. Not bad for a guy who started customizing in 2011. My man Ian Ziobrowski came up for air the other day and sent us these images of a commission he recently completed: the Grindroid is made from a 3" Dunny and a 3" Android figure. Ian says the Grindroid is "one of the most unique pieces of machinery NUGGS have ever owned. 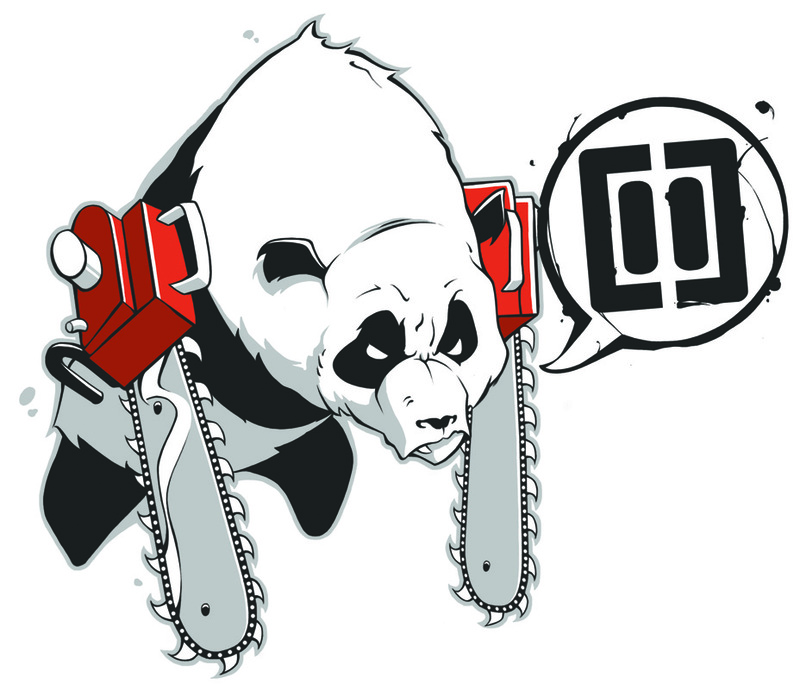 What "Grindroid" does is chomp then mulches to produce some of the finest butters in town. 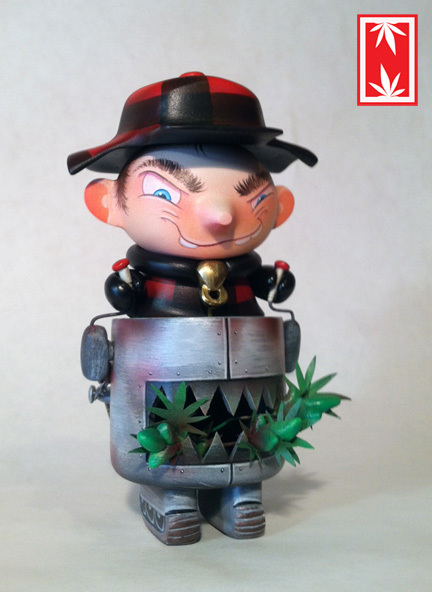 This robot is responsible for some of the best, most desirable snacks in NUGGLIFE!" If you don't get that reference... sorry. I'm not going to explain to you how to make proper spacecakes on this blog. If you want to get in touch with Ian, you can hit him up via email here. He's a busy dude but as you can see, his commissions are worth the wait! You can also hit him on Facebook, check his work out on Flickr and visit his website, which is under construction but nearing completion! 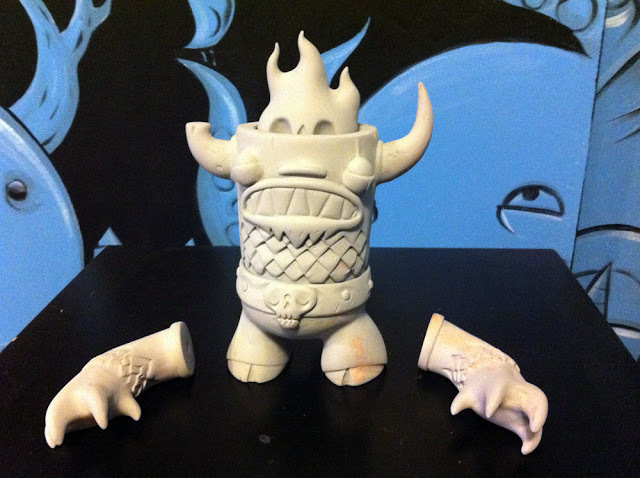 By the way, Ian will be rolling out a resin toy this year with the help of Matt Anderson. So... get ready. You can buy pieces by DAVEMARKART at his new web store and follow him on Facebook. "HOPEFUL HEART" (at left) with balloon stands 8.5" tall. 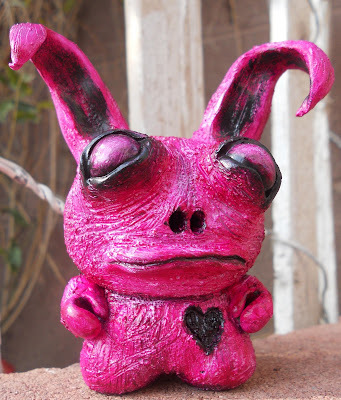 This custom vinyl toy was created using super sculpey, acrylics, wire, and Dave's creative mind... the figure has a matte finish, the eyes and balloon have a gloss finish. 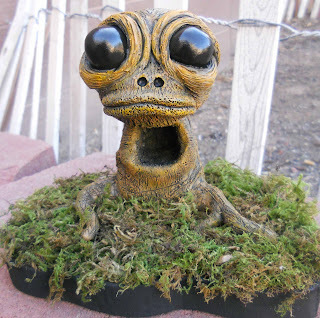 "EMPTY AS A HOLLOW TREE" (below) is a 4.5"tall custom using super sculpey and acrylics. It has not been mounted to base in case the buyer wishes to display without base. At bottom is "THE LOVE BUNNY" which is a 3" custom dunny made from super sculpey and acrylics. 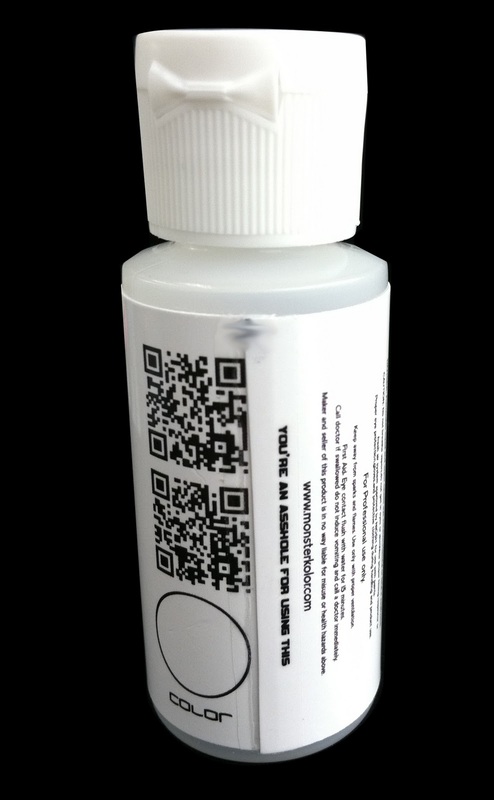 It has a matte finish and the eyes have a high gloss finish. 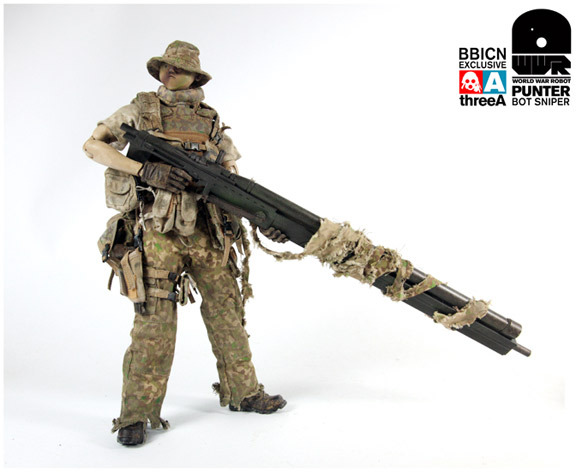 Look out for an exclusive custom series by Dave which we will be selling at Tenacious Toys! 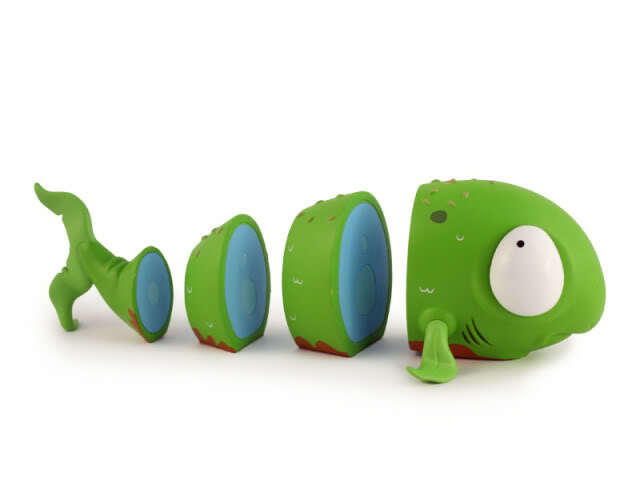 On the back of the massive response from the first Ziqi x Creo Design - QiQi teaser poster earlier this month, Scottish Designer Art Toy Producer Creo Design is proud to present a new QiQi teaser poster for fans to drool over. QiQi, created by Singapore based artist ZIQI - will come in 3 cool colourways: Original Red, Metallic Black and Metallic Red. 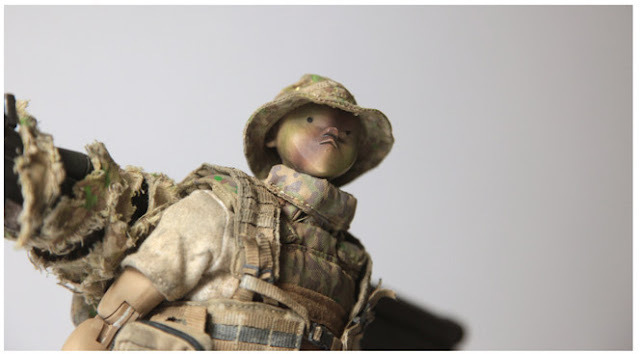 QiQi will be 3'' high and will have articulation in his head and arms! 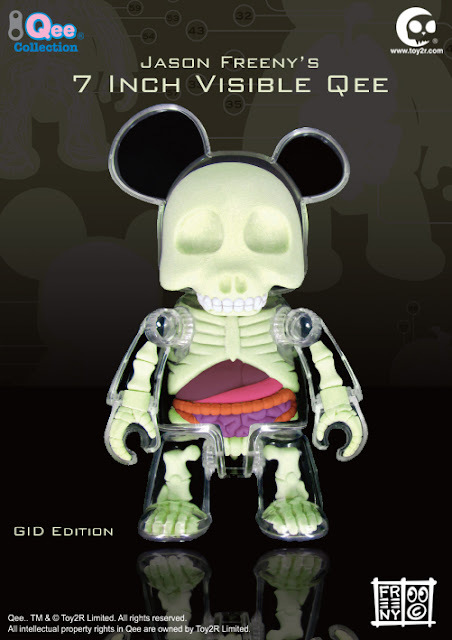 This first series is very limited and due to be released in Q1 2012. 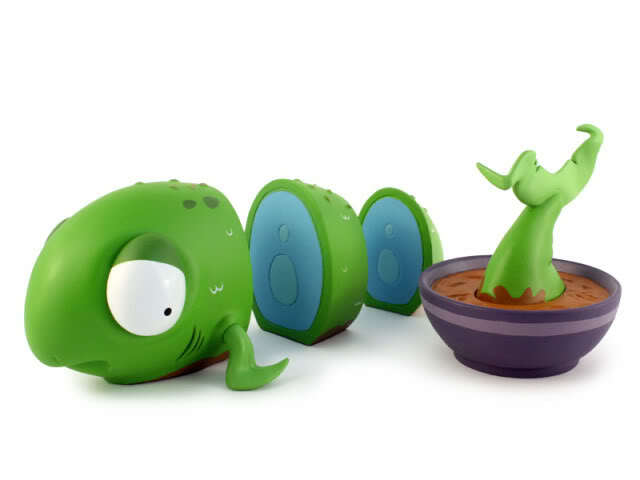 We also have plans for a further limited edition release in Q2/Q3 of a very limited batch of QiQi toys, details will be announced nearer the release date. We hope that fans are excited to almost see the full shape of QiQi and we hope to bring further details on prices and release dates soon. More information on ZIQI and QiQi can be found here. We're always extra-excited when a friend of the shop has a production toy released! 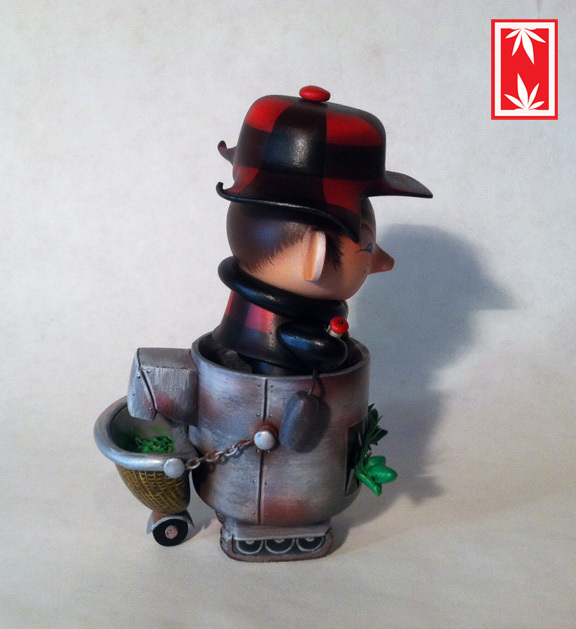 In this case, British artist Jon-Paul Kaiser has been working with Toy2R on this original sculpt called Captain Sturnbrau. We hosted JPK for a signing at the NYCC booth we split with Toy2R last year. Our booth was the spot where this Sturnbrau piece was revealed for the first time. 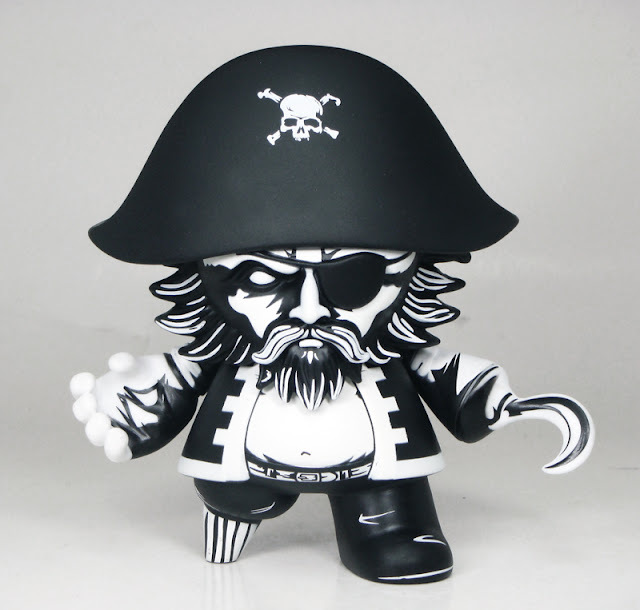 Captain Sturnbrau is the salty captain of the Whispering Corsair, commanding Nathaniel Vigo (his First Mate) as well as Olaf the Mute, both of which are also production Qees made by Toy2R. If you've been eying up the JPK customs in our shop, but they're a little more than you want to spend right now, you can get the next best thing: a production toy with the same clean and detailed black & white paint work which JPK has become known for. Toy2R did a bang-up job on these pieces. Captain Sturnbrau is in stock now- you can buy yours here. If you wanna follow JPK, he's very active on Twitter. Go tell him you think he's awesome. Mostly Harmless sends us images of his Stego-Clone custom figure, which looks to me like really solid custom work. 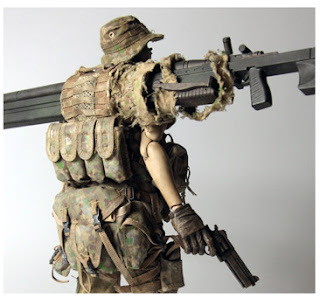 Detailed sculpting and tight painting make for great pieces, in my opinion. I have attached pictures of a recent custom for a "Star Wars vs Dinosaurs" art gallery. The only requirements for the show were to incorporate both subjects in your piece. I made the Stego-Clone out of a Medicom VCD Clonetrooper, dollar store stegosaurus, and sculpt. He was quite a hit and I feel he would be a unique addition to your blogs, etc. 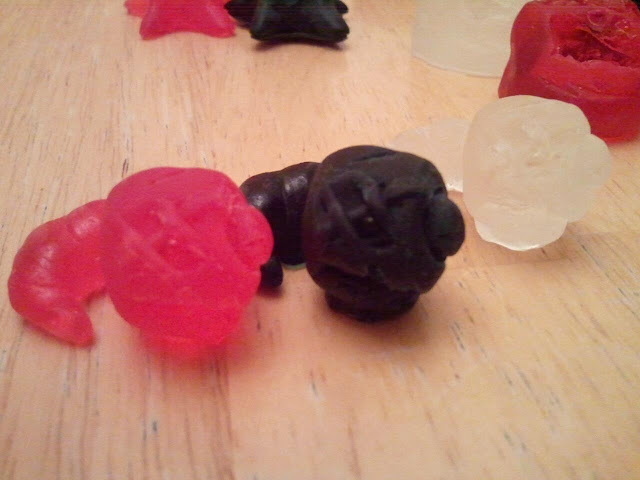 I have also included a link to my Facebook fanpage where I have pics of several other customs. Go check out Mostly Harmless on Facebook. Good stuff! The 7-inch Visible Qee designed by Jason Freeny (which most of us call the Anatomy Qee, since Toy2R makes other Visible Qees) is coming soon. I'd anticipate that we will actually have them in early February. In the meantime, you can still preorder the regular edition (above) and the GID edition (below) from our website here for $80 each.